One of the 65 pages translated for this project, for a total of 2,299 individuals. 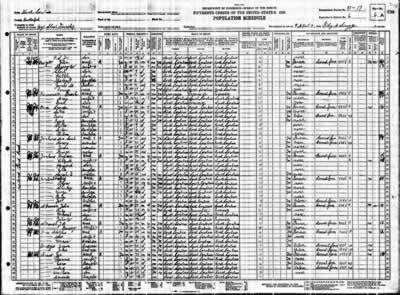 U.S. Federal Census records are divided into groups by state, then county, and in many cases by townships and enumeration districts as well. Enumeration districts are subdivisions used by census takers and other governmental representatives to further break down the geography of a given area beyond the county and/or township level. Here is a list of the data the enumerators were required to collect. Enumerated by Junius Bronner Robinson. Lists residents on Academy, Branch, Church, Cliffside, North Main, Poplar, Railroad, Reservoir, Riverside and South Main Streets; Boiling Springs, Fairview, High Shoals, Hills Creek and Mooresboro Roads; and Goforth Flat, Highland, Lakeview, Shelby Highway and West Avenue. 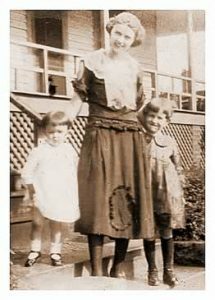 Enumerated by Mrs. Rose E. Smith. Lists residents on Ferry Road and part of Riverside Street. Enumerated by Flay A. Scruggs. Lists residents on Cliffside Road, Highway 207, New Road and Riverview Street. Some of the street designations in these enumerations are puzzling. Some, such as Branch and Riverside Streets, are listed, although they are not on any contemporary list or map, while some streets that we know existed at the time, such as Valley Street, Beason Road, Pine Street and Highway 120, are not listed. Or, at least, no street was attributed to their residents. Could the enumerator have been unaware of these streets’ actual names and simply renamed them? Mr. Robinson, who did the greater part of the enumeration, was either careless or uninformed about many of the streets’ names, and paid little attention to the correct spelling of names. He apparently assumed that our “cross streets,” the numbered streets running east and west, had no names at all. So he assigned their residents to the nearest “major” (north-south) street. If, for example, you lived on the eastern end of West Fourth Street, you became, in the census, a resident of North Main; if you lived on the western end, you were assigned to Railroad Street. Where was Riverview Street? Which side of the river was it on? Was it what we know as Island Ford Road, or did Mr. Robinson rename a part of South Main? Could it be Pine Street? Where was Mooresboro Road? Could this be what we know as Beason Road. Was Fairview Road an extension of Shelby highway? Was Boiling Springs Road an extension of Fairview Road? If so, Mr. Robinson had ventured outside of the township and, indeed, out of Rutherford County. The names on each of his pages have spellings he thought to be correct, seeming not to confirm their accuracy with the owners. We’ve changed many of the names to the spelling we know to be correct. Some, we’ve guessed at. We changed “Burdges” to “Burgess.” Others, like his consistent use of “Margret” (for Margaret), we’ve left alone. Unfortunately there are few house numbers recorded, depriving us of knowing exactly where families lived. But the names in our street listings are in exactly the same order as on the original census sheets. Riverside Street later came to be called River Street. Highway 207 is the road beyond Riverside, known in those days as the “Chesnee highway” (now 221-A). As you look over these lists, if you determine the answer to any of these puzzling questions, or if you detect any misspellings or misinformation, please let us know.